Helping to celebrate the 20th anniversary of New Orleans’ Japanese sister city, Loyola University New Orleans is sharing copies of letters from 19th-century literary and cultural icon Lafcadio Hearn with Matsue, Japan—the town where Hearn fell in love with the local folklore and traditional tales for which he is best-known in Japan. Loyola English professor Barbara Ewell, Ph.D., delivered reproductions of six of Loyola’s letters to Matsue this summer, and a City of New Orleans delegation led by Donna Fraiche J.D. ‘75, former chair of Loyola’s Board of Trustees, will deliver the seventh letter, among other gifts, next week. 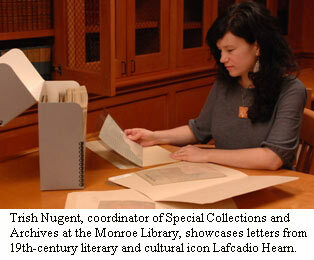 The Lafcadio Hearn Collection at Loyola’s nationally recognized J. Edgar and Louise S. Monroe Library includes more than 50 items, mostly unpublished correspondence between 1884 and 1897 from Hearn to Page Baker, his friend and editor at the Times-Democrat newspaper in New Orleans, according to Trish Nugent, coordinator of Special Collections and Archives at the Monroe Library. Hearn lived in New Orleans from 1877 to 1887 and moved to Matsue in 1890. In Japan, he became known as Koizumi Yakumo and gained an international reputation for his culturally significant books about the country, particularly his collections of Japanese ghost stories and other folklore. Though Hearn is known primarily to Southern literature scholars in the U.S., he is a beloved national figure in Japan. “Hearn’s many essays about Japan helped to shape Westerners’ impressions of this unfamiliar culture, even as he preserved for the Japanese themselves traditions and stories that were on the verge of disappearing,” said Ewell, the Dorothy H. Brown Distinguished Professor of English at Loyola. Ewell received an enthusiastic reception from the Japanese earlier this summer. A ceremony at the Matsue City Hall was attended by city officials, Hearn’s great-grandson Bon Koizumi, and nearly a dozen reporters from television and print media, whose accounts of Loyola’s gift appeared throughout Japan. The Hearn Collection is available for research in Loyola’s Special Collections and Archives. Please contact Nugent for more information. For media interviews or high-resolution photos, please contact Mikel Pak, Loyola associate director of public affairs.